This award is named in honor of one of our co-founders Kathy Brooks. Kathy, along with her husband Steve and her third level horse Sunny, moved to Alaska in 1979 where the only dressage classes she found were those held in open shows with unrecognized judges. Often, the score sheets from these classes had only the score and no comments. The need for a dressage association was obvious to her and by January of 1980 ADA had been incorporated. Qualified judges were retained and AHSA (now USEF) and USDF- recognized dressage shows began in Alaska. The first ADA show was held in the summer of 1980. Kathy was an example of excellence in dressage in Alaska at that time. Her horse, tack and attire were exemplary, as well as her attitude and her enthusiasm. There was no end to the time that she spent in creating the Alaska Dressage Association and welcoming members to be a part of this group dedicated to promoting excellence in dressage. Kathy continued being active in the association until her return to Alexandria, Virginia in 1987 with her husband Steve, her two young children and, of course, Sunny. She returned to be near the National Institute of Health in Bethesda, Maryland where she was being treated for melanoma. She continued being a member of ADA and to keep in touch with her usual enthusiasm until her death in 1993 at the age of 47. The award was designed and constructed by Alaskan artist Carol Gelvin. It is a horse and rider carved in alabaster stone and Osage orange wood and sits on a base of redwood. Steel spurs, Athabascan glass beads, Alaska Native moose leather and moose bone for the dressage arena letters are other materials that were used in the construction. As the award is intended to honor lifetime achievement it will be awarded only once to any recipient. In keeping with the special nature of the award it will be granted only when a worthy person is nominated, which may not occur every year. The award is a traveling award and must be returned with its case to ADA prior to the Annual Awards Banquet each year so that it may be given to the new recipient. It will bear the name of all of the recipients and will be engraved each year. Have worked to promote interest in dressage in Alaska, exemplifying through their own efforts, high standards in promoting dressage in Alaska. Have contributed time and talent to ADA activities. Have set an example in exhibiting good sportsmanship. Nominations will be accepted from the membership. A form available on the ADA website specifically addressing the four qualifications for nominees listed above must be completed for the nomination and submitted to the nominating committee by September 30th. The board of directors will review all nominees and select a maximum of three who have been found to meet qualifications. If no nominees adequately fulfill the qualifications, the board may choose not to present the award for that year. These nominees will be voted upon by the membership at the same time as the annual election of board members. If only one qualified nominee is presented the board of directors may vote to grant the award without asking for a vote from the general membership. A description of Kathryn Brooks, recipients of the award from previous years, the award qualifications, and a biography of each nominee should appear on the ballot. The recipient will be the individual who receives the most votes. 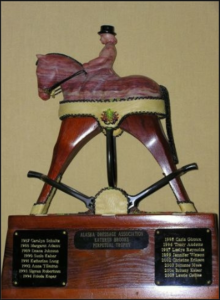 The award will be presented at the Annual Awards Banquet properly engraved with recipient’s name. ADA President shall ensure engraving of award prior to banquet.